Purchase: Smashwords or Amazon for only $.99! When outlaws Amaranthe and Sicarius chance upon spies stealing military prototypes, they immediately give chase. Well, immediately after Amaranthe talks Sicarius, former assassin and all-around non-altruistic type, into the mission. She wants an imperial pardon, and what better way to attract the emperor’s favor than by looking after the empire’s interests? What seems like a straightforward mission develops a hitch when the spies flee to Darkcrest Isle, a forbidding chunk of land reputed to be haunted. Amaranthe isn’t quick to believe in tales of malevolent spirits, so she’s startled when the ever-pragmatic and unflappable Sicarius shows reluctance at setting foot on the island. Only when it may be too late to escape does Amaranthe come to understand why. 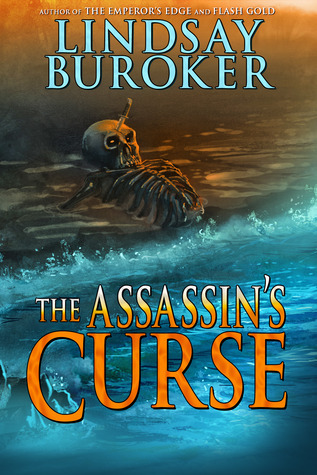 The Assassin’s Curse is a 12,000-word short story. 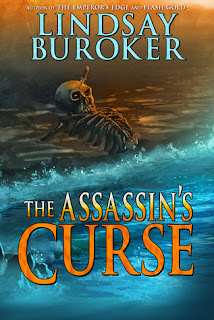 The Assassin's Curse is a satisfying novella to read while waiting for the release of the fourth Emperor's Edge novel. The third novel, Deadly Games, ratcheted up my excitement over the characters and their changing relationships. This isn't YA fiction, and I recently stumbled upon Lindsay Buroker and fell in love with The Emperor's Edge. So far there are three novels and a couple of short stories that focus on specific characters. The Assassin's Curse focuses on Amaranthe, the leader of the Emperor's Edge, and Sicarius, the deadly assassin looking for exoneration. I won't say much about their role in the series but their latest adventure establishes them as the main attraction of the Emperor's Edge. I still say those two have chemistry even though it's hard to see. I love how in any situation Amaranthe and her team gets into they always learn something new about each other. Each mission solidifies their resolve and loyalty to one another. I'm definitely ready to get on with the series and read the fourth novel! Thanks for taking the time to read the story and post a review, Candace! That's one of the main reasons why I like Amaranthe, she won't give up Sicarius!